White twinkle satin bodice with bright fluoro pink embroidery faux waist belt featuring a gorgeous flower motif. 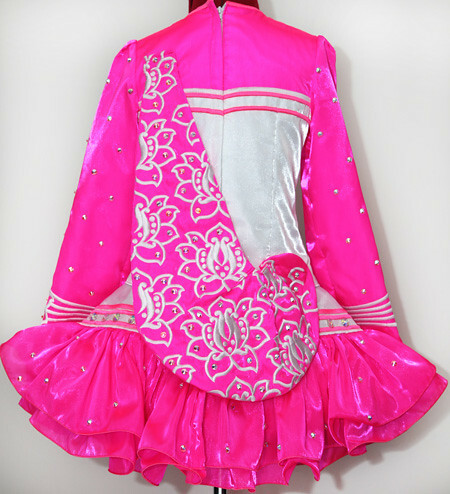 Fluoro pink twinkle satin sleeves and shoulder yokes in the modern bolero style with matching embroidery on the sleeve cuffs. Modern style skater skirt constructed from fluoro pink twinkle satin layers. Beautifully embroidered pink satin shawl with matching flower motifs look like a custom made fabric. Fluoro pink and white polka dot underskirt lining. Matching bloomers and embroidered headband with Swarovski crystals. Hundreds of Crystal AB crystals in various shapes and sizes for added sparkle. Large 14mm round and teardrop crystals have been hand sewn onto dress to ensure they will not fall off twinkle satin fabric. Immaculate condition. Made in July 2012. Worn only 3 times.